Inspired by Yoga for Your Brain (see earlier post, InTheMail), I created a new tangle. I don’t have a picture of the photo that inspired me, but I found it while looking through a magazine in the doctor’s waiting room. The article and photos dealt with an architectural dig in Central America. I was surprised to find a tangle pattern among the ancient artifacts! 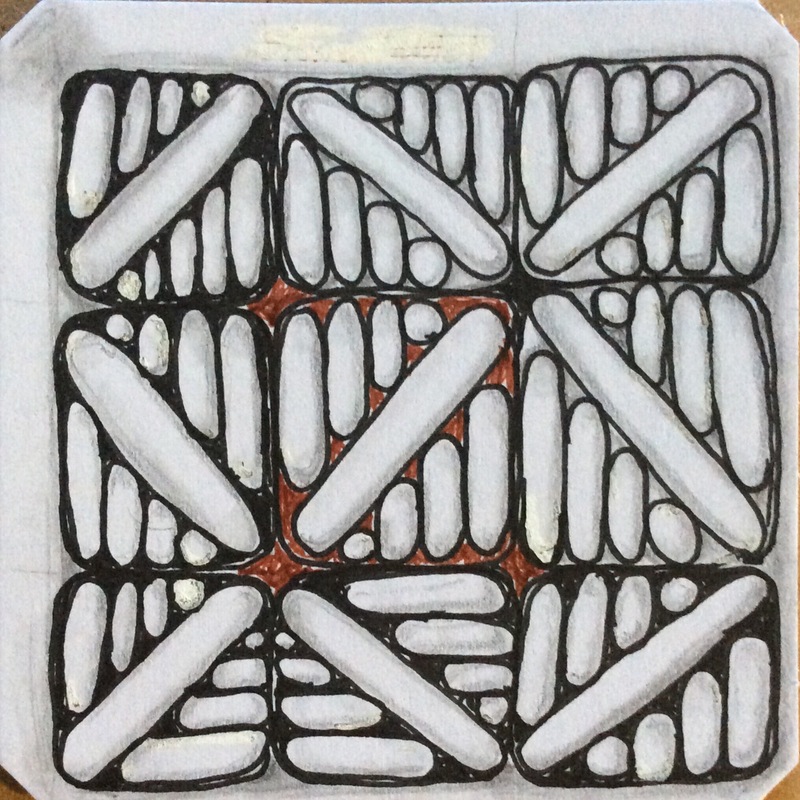 It was two days before I recorded what I saw as a potential Zentangle pattern. To my eye, it functions best as a grid or border tangle. This picture shows a hurriedly drawn grid with a few minor differences in the basic pattern–shading, rounding, rotation. I think it might also work well as a background pattern, but we’ll see what I come up with. 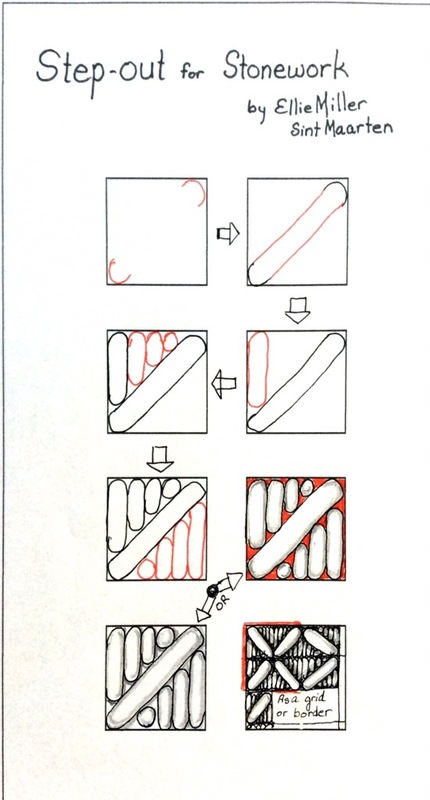 If you want to try it, here is the step-out. For me, I start diagonal ovals and rounded strokes with rounding off the corners. Part of the reason is that my astigmatism causes distortion of lines for me. It is easier to connect two points than to try to figure out where to start curving–I am almost always wrong when I try to guesstimate. In drawing the smaller oblongs, I start with the longest, basically doing the same thing as for the diagonal with the rounded ends. The rest of the row is just elongated C’s, followed﻿ by a circle. Finally, I either round (fill in) around the ends or shade. When the pattern is used in a grid with rotated diagonals, the effect can be flower-like. As a border, the patterns can all go in the same direction, or the direction can be rotated. In corners, the pattern can be “mitered,” especially if the horizontals and verticals are drawn in different rotations. Before creating the step-out and naming the pattern, I checked through all the patterns in TanglePatterns.com’s latest e-book catalog (2017) called Presenting … The Tangles. To the best of my ability to discriminate, this tangle is unique. Two or three patterns might be roughly similar, but none share more than one characteristic with Stonework. One pattern has stacked oblongs, but they are all the same size. Another pattern has a diagonal oblong, but no vertical or horizontal ones. That’s as close as other patterns came to this one. Please let me know if Stonework is the same as another pattern. Zentangle is an international community, and not all countries share tangles. I have seen tangles on various web sites online that are identical but share several different names. At the very least, I would like to share the names of the patterns for cross-reference. If you use this pattern, please leave a comment and a picture or link to where it is posted. Thanks! Thank you so much, Jody! You are an inspiration to all tanglers out there! Hugs! Jody, thank you for all your encouragement and support! I would not have had the courage to share a new tangle pattern without them. Dear Ellie, thank you for sharing this wonderful tangle /pattern with us. I will certainly try it out soon. It could happen, that two artists have the same idea, but that showes the energie and flow around the whole wide world. And if there is respect and honor, then it turns always in something beautiful and creative power. What a beautiful thought! Thank you so much, Barbara. I always appreciate your words, artistic tangles, and encouragement. There is nothing better than hearing from a tangler whose work I so admire. See you on Mosaic!